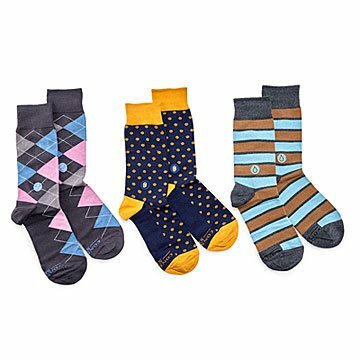 These stylish socks are so wonderful, they literally make the world a better place. These socks are not only stylish and comfortable, but they're also saving the world. Talk about putting your best foot forward! The set includes three pairs, each with a lively take on classic business styling. They're made from a blend of organic cotton and stretchy synthetics, making them wonderfully soft and providing a great fit. Made in India, the entire supply chain for those materials is certified organic and vegan, and their manufacturing is Fair Trade Certified. And if that wasn't enough to have you walking on air, a portion of the profits from each pair is donated to a good cause—fighting hunger, providing clean drinking water, and donating books. Made in India.